Billions in mystery money are flowing through Toronto real estate thanks to weak federal transparency laws, reveals a joint study released Thursday by Transparency International Canada, Publish What You Pay, and Canadians for Tax Fairness. The report, OPACITY: Why Criminals love Canadian Real Estate and how to Fix it, analyzes more than 1.2 million property transactions in the GTA and examines how criminals penetrate Canada’s real estate sector to wash their dirty money. We also propose solutions to fix some of these regulatory gaps, including the establishment of an open and accessible public registry. Our organizations have launched a separate webpage dedicated to raising awareness about snow-washing and this story is rapidly gaining traction in both English and French media, including prominent coverage in the Toronto Star. Despite a couple surprises Tuesday, Finance Minister Bill Morneau delivered what was very much an election-year budget that splattered spending in different directions and played it safe with voters. We were encouraged by the partial closure of one tax loophole (more on that below), some green subsidies, and commitments to pursue money laundering, but ultimately this budget bypassed several bigger opportunities such as recovering $20 billion in lost revenues by closing tax loopholes, including applying tax to digital giant corporations, as other G20 nations are doing. Bolder action in these areas could fund accessible childcare, national pharmacare, and other investments this budget left out. C4TF director Toby Sanger discussed some of the budget’s hits and misses in a CPAC special budget panel this week. As the government shifts gears to the fall election, we will be looking to the parties’ platforms to do more for tax fairness. The budget included a surprise announcement that the government is finally planning to restrict the stock option deduction, a highly regressive tax loophole that Canadians for Tax Fairness has campaigned against for years. Over 90% of its benefits go to the top 1%, allowing CEOs and others to pay tax at half the rate the rest of us pay on our employment income. For instance, this loophole would enable Canada’s top paid CEO, Richard Baker of HBC, to reduce his tax bill by $4.5 million last year alone. Unfortunately, the Liberals aren’t planning to completely close this tax break, but cap it at $200,000 annually for employees of large, long-established firms, while leaving it open for others. It’s unlikely to become law before the fall election, but this is the first time the measure has made it into a budget. As we told the Globe and Mail this week, expect this to be a significant issue in the upcoming election. Most Canadians support higher taxes for the wealthy if it means improved public services, according to OECD findings published this week. The survey was conducted last year and included 22,000 people across 21 OECD countries. It found that 69 percent of Canadians support progressive redistribution – slightly higher than the national average of 68 percent. Support was strongest in Greece and Portugal, but concerns were similar across all countries. Financial security in old age was top of mind while healthcare and housing weighed heavily on respondents. The report, which was released on federal budget day, also comes at an interesting time in the US, where talks of taxing the rich continue to dominate headlines. Add these newspaper opinion pieces to your weekend reading list. The authors make an important link between fairer taxation and improved equality across Canada. Whether it’s leveling competition for businesses, bridging the gap between rich and poor, or balancing gender discrimination, taxes play an important role and we need more voices to remind government of that. Events: Those in the Toronto area may be interested in attending a free public presentation on the relationship between global tax evasion and poverty in Africa. 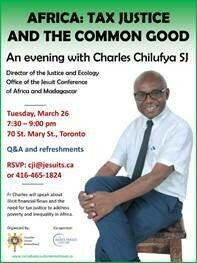 The talk, titled “Africa: Tax Justice and the Common Good” is being held Tuesday March 26 and features guest lecturer Charles Chilufya SJ, who is visiting from Africa, where he is Director of the Justice and Ecology Network for the Jesuit Conference of Africa and Madagascar. His presentation will focus on how illicit financial flows exacerbate inequalities in Africa. If you know of a tax fairness event in Canada that should be included in our newsletter, please let us know.